Colbert is a practicing Roman Catholic and a Sunday school teacher and an ordained minister with the Universal Life Church Monastery. These two (bolded) things, according to various media reports and the blogsite of the Universal Life Church Monastery are factually correct, so I'm not asking if they are possible, but whether according to official Catholic doctrine the two are reconcileable? The Picture is of Colbert officiating at the wedding of Mike Cassesso and MaiLien Le using a licence granted to him in the state of New York on the basis of his ULC credential. 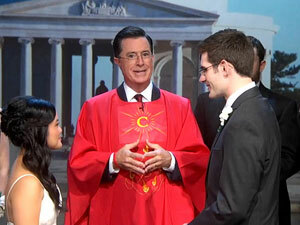 Clearly Colbert was not officiating as a priest in the Catholic sacrament of marriage, but do his actions in conducting a non-Catholic wedding violate any particular Church teachings? If so, would it be regarded as a venial sin or a mortal one? Did I endanger my faith by joining or attending meeting of organizations opposed to the Catholic Faith (non-catholic services, the Communist Part, free-masonry, "new age" cults or other religions)? Did I take part in one of its activities? No, that would be "joining a non-Cathoic service". The church looks pretty new-agey too. Mr. Colbert, has no obligation as a TV personality to perform secular duties to marry people like a ship's captain or the Mayor of Pittsville. The gravity of the sin, I think is varied by why he is doing what he is doing. I'd say, at least he's not obviously officiating an illicit marriage, but why he's in that position, looking like an ordained minister - functioning as an ordained minister of a sect that holds values opposed to his own. Minister: Ladies and gentlemen, it is my pleasure to present to you Mr. and Mrs. Sally and Kevin Smith! Minister: By the power vested in me, by the Universal Life Church and by the state of Delaware, I pronounce you, Sally and Jennifer as wife and wife, lawfully wedded before God. Minister: Ladies and gentlemen, it is my pleasure to present to you Mrs. and Mrs. Sally and Jennifer Smith! and that's what they consider a Christian marriage service. Now, there are lots of Christians who think this is peachy, but Catholic's can't just do what they want and not consider it sinful behavior, that's the price one pays for consuming the Body and Blood of Christ and also what one sacrifices when they knowingly commit a mortal sin. One thing to note is, the reason this is not good is because it "endangers my faith". It's a serious occasion of sin for a private individual. But, being a public figure and a self-proclaimed Catholic, it becomes scandalous, which is always worse. This is the kind of stuff that needs to be denounced just as publicly as it was done in the first place. Not the answer you're looking for? Browse other questions tagged catholicism sacraments church-discipline entertainment or ask your own question. Catholics ordained as “mail order ministers”? What is the biblical basis for restricting administration of the sacraments to ordained church leaders? Is there such a thing as a 'concordat' today in the Catholic church? Which sacraments can hermaphrodites validly receive in the Catholic Church? Who can give the sacrament of confirmation in the Catholic Church?